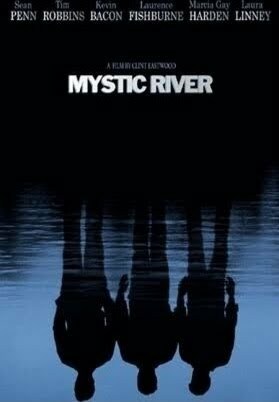 Directed by Clint Eastwood, the mysterious drama Mystic River is based on the novel by Dennis Lehane and adapted by screenwriter Brian Helgeland. Set in an Irish neighborhood in Boston, Jimmy, Sean, and Dave are three childhood friends who are reunited after a brutal murder takes place. Reformed convict Jimmy Markum (Sean Penn) and his devoted wife Annabeth (Laura Linney) find out that their teenage daughter Katie (Emmy Rossum) has been beaten and killed. Jimmy's old friend Sean Devine (Kevin Bacon) is the homicide detective assigned to the case, along with partner Whitey Powers (Laurence Fishburne). Jimmy also gets his relatives, the Savage brothers (Adam Nelson and Robert Wahlberg), to conduct an investigation of their own. Jimmy and Sean both start to suspect their old pal, Dave Boyle (Tim Robbins), who lives a quiet life with his wife Celeste (Marcia Gay Harden) but harbors some disturbing secrets. Clint Eastwood won a Golden Coach for Mystic River at the 2003 Cannes Film Festival.